Bezalip retard (Bezafibrate) works by reducing cholesterol and lipid levels in the body, so as to minimize the risk of developing heart disease or other related conditions. It is generally only given to patients with high lipid levels which have failed to be brought under control by other measures (such as dieting, weight loss and exercising). Bezalip retard (Bezafibrate) works by reducing cholesterol and lipid levels in the body, so as to minimize the risk of developing heart disease or other related conditions. It is generally only given to patients with high lipid levels which have failed to be brought under control by other measures (such as dieting, weight loss and exercising). Medical research has demonstrated that this medication exhibits a complex range of different effects on enzymes required for the metabolism of fats, as well as acting on lipoproteins. Its mechanism of action is believed to be stimulating and increasing the activity of lipoprotein lipase and hepatic lipase so as to trigger an increase in the amount of triglycerides broken down. Triglyceride production is also reduced. Significant reductions in the plasma triglyceride levels, as well as cholesterol is therefore possible in patients with high lipid levels. 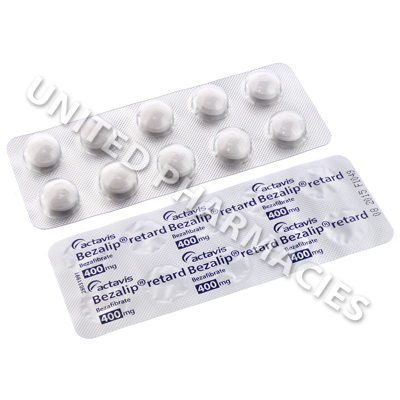 Bezalip retard (Bezafibrate) tablets are swallowed whole alongside a glass of water, and may be taken with meals or after eating. Your doctor will determine the correct dosage regimen based on the results of a medical assessment and any other necessary tests. Adults are normally instructed to take 400mg (1 tablet) once every day. Treatment of high cholesterol is generally on a long term basis, and you will be required to continue taking it for as long as your doctor deems necessary. It will be necessary to make the doctor aware of any side effects that are experienced during treatment. Also, there is a risk of severe reactions occurring. Immediate medical treatment will be required if you notice severe abdominal pain, a burning sensation affecting the limbs, gallstones or any other serious reactions which are not listed here. Although considered rare, some patients may experience side effects which affect the muscles. These may include pain, a tender feeling and weakness. Visit your doctor straight away if this happens. A healthy diet and regular exercise may be recommended by your doctor in order to ensure that cholesterol can be effectively reduced. Ask your doctor about this before beginning treatment. 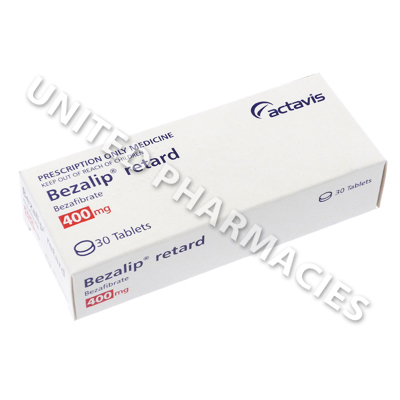 Always use Bezalip retard (Bezafibrate) as you have been prescribed by your doctor. Never self-medicate or change your dosage without first consulting your doctor. The correct dosage can vary depending on your health, medical history, and the severity of the condition being treated.